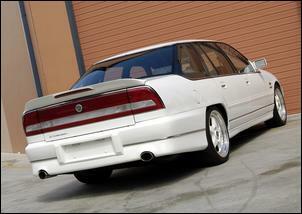 A one-off CSV Statesman La Classe with stroked and supercharged muscle. They don’t come any rarer than this. The CSV Statesman La Classe 5800i SC seen here is a one-off build - you won’t find another like it anywhere in the world! 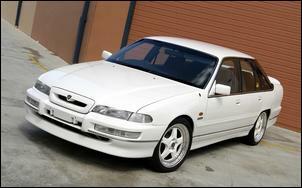 Based on a 1996 Holden Statesman, the La Classe 5800i SC was built to specification by CSV (Corsa Specialised Vehicles). The car’s current owner, who we’ll call Mr X, purchased the car about 12 months ago from the original owner. "The car remains pretty much as it was built by CSV in the late ‘90s, except the sequential Hollinger gearbox that was fitted had been replaced with a 2-speed Powerglide," says Mr X. His mission since acquiring the car has been to revive it to as-new condition - there’s no need for further modification because, well, it’s already modified to the max.. The standard 5-litre capacity has been stretched to 5.8 litres using a Harrop stroker kit and overbore. A set of Carillo rods and low compression forged pistons are also employed. The alloy heads have been treated to an extensive port and polish job and an aggressive camshaft has been slipped in. Valves, valve springs, pushrods and the timing chain have also been upgraded. Oh, and the block is a Larry Perkins item - no expense was spared in the build. The standard Holden 5-litre V8 has a relatively restrictive intake manifold - so you won’t find that anymore. The cylinder valley is now filled with a CSV twin-screw supercharger set-up with a custom adaptor manifold. The blower has a long drive snout which required cutting a small notch in the radiator fan shroud. The intake to the blower comprises a pair of large diameter throttles which are opened in unison (rather than sequentially). The twin throttles are attached to a custom elbow which is squeezed behind the rear of the blower and the firewall - there’s not a lot of space back there. 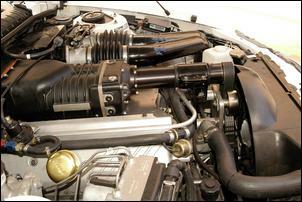 Twin mandrel bent pipes feed filtered air from inside the front left guard. There’s no intercooling but a water injection system squirts H2O into the inlet tract before the blower. This helps cool the charge-air temp (and the blower) when running up to 16 psi boost. The engine has recently been detuned slightly from this. When the combustion process is complete, spent gases are collected by a pair of headers leading into an ingenious dual-mode exhaust. 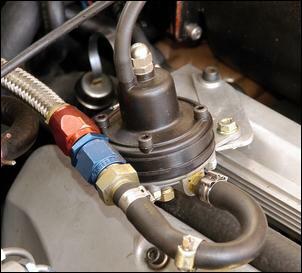 In normal driving, gases are put through a twin 2 ½ inch system with effective muffling. 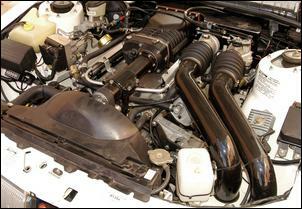 However, a third pipe opens as the engine reaches a present boost level - this third pipe is unmuffled and the outlet is hidden beneath the car. The car currently runs a MoTeC M800 programmable ECU with MAP load sensing. The M800 works with a single coil ignition arrangement and an upgrade fuel system. A big set of injectors, a Malpassi pressure regulator and Bosch Motorsport main pump provide the juice for the boosted 5.8. At present, the engine drives through a modified Powerglide trannie with a suitable rpm torque converter. 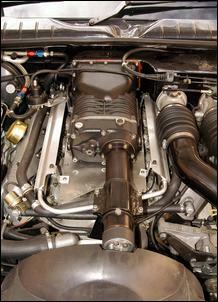 A trans cooler can also be found in the nosecone alongside an engine oil cooler. Fortunately, the Le Classe 5800i SC is fitted with Harrop 4-pot front and 2-pot rear calipers teamed with large diameter cross-grooved discs. 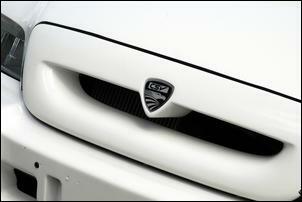 These combine with the standard ABS system for tremendous braking power. The suspension has also been enhanced with an aftermarket spring and damper set-up by CSV. CSV don’t do things by halves and you’ll find the body is equipped with a kit which is unique to the brand. The CSV kit comprises a replacement grille, skirts, front and rear lower spoilers (with twin tailpipe cut-outs in the rear), a subtle rear spoiler with LED brakelight and CSV badges. Everything is colour-coded white for that ultra-clean look. The rims are matching Simmons three-piece 18s wearing 245/40 and 265/35 tyres. And there’s something else about this car that’s difficult to put your finger on. It’s the amazing presentation. The car has extremely low kilometres so you’ll find there a no scratches in the glass, no paint deterioration, the rubber and plastic is like new and the interior is tip-top. The interior, by the way, is decked out with standard leather and features a CSV build plaque and remote control Alpine television. Boost and oil temperature gauges are also hidden behind a fold-out panel - very neat indeed. Mr X says the La Classe has had more than AUD$250,000 spent on it in total (including the initial CSV build) and it’s stunningly quick to drive on the road. And it's quick without being an obnoxiously loud and misbehaved beast - we’re talking refined but muscular performance. You won’t find one cheaper - because there aren’t any!